After my vocal encounter in 2013 I have spent allot of time deliberating about this issue, and why such a creature somehow, almost against all odds, against logic, exists. I have come to the conclusion that this creature is not human nor strictly ape, but something of a higher order of ape, or lower order of human if you want to lump all primates into one box. They are intelligent in ways we cannot comprehend, and yet have not mastered much of what supposed primitive man mastered. They exist in the void between man and apes, and capitalize on secrecy and stealth. They are fewer in number than practically any other thriving specie, yet I think they are doing well despite our encroachment. The stunning gap between humans and all other creatures is not really lost by this creatures existence, although we must acknowledge that its existence leads us to ask certain questions about the why, how, and where, of it's existence. We cannot fully answer any of these questions but some things do stand out, like the niche they inhabit, and how few competitors they have given their adaptions. A cold climate great ape of higher intelligence, and adapted for extreme secrecy. If we look at the large gap of human society and primitive survival of the past, something had to fill that niche. If such a creature could exist it would come from the great apes, and that is what I feel is the origin of this specie. Not that it was an offshoot of the modern apes, but it's own specie that rose to fill that niche as man developed his current niche. The point I am making is simply that as that gap grew, something of this sort was practical and likely to fill where we no longer dominated. It's like it fills that netherworld that is a million years or more ahead of the Great Apes but a million years or more behind Humans. Maybe still an ape mentality (I've compared that aspect to a bear's intellect) but in a body more advanced toward Human. As far as being a perfect physical set up for living in the wild one couldn't do much better. An animal mind in an advanced primate's body is exactly where I think this creature's evolutionary level is. Is this close to what you are describing? In other words, the creature evolved to fill that void left when Humans moved up the tree far beyond the Great Ape world? Or evolved along side Humans and Apes but along a branch of their own? An ancient hominid branch that didn't die out like the rest? An extremely limited model of their behaviour and morphology on its own can narrow them down to an undiscovered species that’s near-human, but such a theory can fall apart if one has a more complete understanding in those areas or even a sole understanding of their genetics. In practice, the morphological and behavioural model of sasquatch that researchers generally use isn’t nearly that limited. In other words, researchers are aware of the sasquatch’s cold weather resistance, night vision, intelligence, sprint speed, wide and strange geographical range, wide color variety in isolated places, the lack of novel DNA, and the frequent Homo sapiens sapiens DNA result. But even with such a comprehensive model of the sasquatch, researchers only ever indulge in theories that include evolution as the sole process by which the sasquatch’s biological progression has occurred when there’s a well-founded and scientific alternative that should be in the mix by logical necessity. If humanity had the ability to genetically engineer what people are witnessing, such a theory would have been brought up by now without me. That’s because evolution IS the sole biological process for which gives rise to species. There is NO well founded alternative. And especially not Aliens cloning Bigfeets and beaming them down to Earth. I have wondered if the Planet of the Apes movies are more fact than fiction. Could it be that sometime within the last million years some giant ape made an evolutionary leap and evolved into BF. Certainly it does not seem to fit any expected path of development supported by main stream science. . 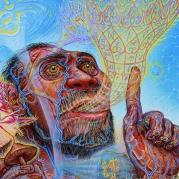 It humans did not exist it would be the most advanced primate. But since humans do, and have throughout the existence if BF, it has had to be reclusive in order to survive as a species. Look what happened to Neanderthal. . To humans, a species willing to take on a woolly mammoth with nothing more than spears, an 8 or 9 foot biped is just another challenge. For all we know they were considered good eating. Makes you wonder then, where are the stories passed down about hunting BF, where are the fossil records of BF bones displaying signs of spear marks, where are the cave drawings of BF being hunted? They very well could be out there but misinterpreted. We have mastodon bones that exhibit “human” predation in California that are over 100,000 years old. And we have Cave paintings of Bigfoot as well. It would seem that most oral traditions concerning Bigfoot, They actively chose not to hunt them. But that wasn’t always the case in reverse. There is only one reason why it should it exist in our wilderness. That is that the habitat is there for it to exist and survive in our wilderness no matter where it might find itself in this giant world. It lives because it wants too. Just like we do it does too. Pretty much what SB said. In biology, if the niche is open, something will adapt to fill it. The niche was open. I would revisit LCB's initial question. My perception is different ... it's us humans that are the weirdos in the equation, the animal that doesn't fit with the others. Based on other animals, bigfoot is somewhat predictable by extrapolations, **we** are much less so. ^^^This. And I say this as one of the billions of hairless bipedal mutants that this planet has spawned. Everything else fits the primate mold- we do not. If it wasn't for us Sasquatch would be at the top of the primate evolutionary ladder by a mile. Although at its level there would be more hominid competition from other species, even Neanderthal, and there probably was until all else ceased to exist- except us industrious little 'skins' that is. Very insightful, SB. Excellent posting. To LCB, I would point out the singular of "species," is "species." How about trying to contribute something to the conversation beside snide remarks? Hiflier hasn't had a reason to wag his finger at me for a while now. He probably welcomes the practice. Ok, on topic then: Sasquatch should exist because a handful of people untrained in biology or science get together on the web and make up reasons why it should. I'd like to take issue with that statement.